As of now (2019-01-03), version 2.0.0.2 is a stable release. You can find the release notes below. 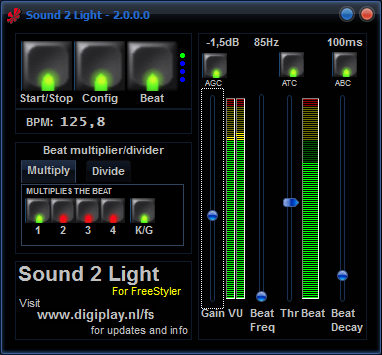 S2L (Pronounce as: sound to light) is the free 'beat detector' for FreeStyler and it is included in the FreeStyler setup. It records the audio from your favorite selected soundcard, analyzes the audio and calculates where the beats are. Those beat moments are sent to FreeStyler for nice light shows. With every beat you can make FreeStyler to go to the next step in a sequence or make a light flashing. We have implemented a beat divider, so sou can send one beat signal to FreeStyler after 2 (or 3 or more) beats. There's also an opposite of that, the beat multiplier. One beat from your audio signal, results in 2 (or 3 or more) beat signals that are sent to FreeStyler. SL.exe gets installed in the path where you installed FreeStyler.exe (You might want to double check the installation path). Once you activate the sound 2 light feature in FreeStyler, this Sound 2 Light application launches and off you go! After you started the the beat detection, FreeStyler receives the beat signals from Sound 2 Light and does with it what it needs to do. It looks neat and fresh. Internal audio engine completely rewritten. Removed all old MME (Windows Multimedia Extensions) code. No need for 'Stereo-mix' or 'What you hear' driver support. S2L v2 supports 'monitoring' the output of every audio device in your system, out of the box. Just select the output you want to get your beat triggers from. (that is, where your audio playout is running). S2L will do the rest. Of course selecting any input device will still work just as good. Config is shown in a seperate window for better user experience. When you click the Config button, a config window appears where you can configure your audio source, sequence restarter and beat flash buttons. You can optionally leave the config window open and drag it aside so you can control both the S2L main window and the config window. For easy and fast access, sequence restarter and beat flash buttons are now lists instead of pull down boxes. Settings (sl.xml) is saved into the generic windows program data path. This is to comply with Microsoft Windows rules for saving system wide program settings and prevent errors like 'Access denied' when trying to write the settings. Support new Windows common controls. The beat multiplayer/divider is moved from config to the main window. You can switch operating mode by pressing one of the tabs "Multiply" and "Divide". E.g. "Audio format: 44,1 kHz / 2 ch / 32 bit" is shown in the config window, below the audio source, for informational purposes. Press the Config button and choose the audio source you want to get your beat triggers from. Start or stop the audio processing and beat triggering. Show or hide the config window. Automatic Gain Control. S2L will try to amplify low audio levels to an acceptable range for processing. Most users have this button enabled. Controlled by AGC when enabled. When AGC is disabled, you can set input audio volume here. Set the frequency response where S2L should try and find the beats. Auto Threshold Control. S2L is automatically determining the best beat trigger level. Threshold level. Controlled by ATC when enabled. When ATC is disabled, you can set the threshold yourself. The VU-meter next to it might be helpful for that. Auto Beat decay Control. S2L is automatically determining the best beat decay, which could also be read as beat hold time. Controlled by ABC when enabled. When ABC is disabled, you can set the decay value yourself. Set operating mode to multiply. Buttons 1..4 shown on the tab set the multiply value. Keep on Going. When enabled the beat triggers will continue in the same rythm when music drops out. Set operating mode to divide. Off: No divide. Buttons 2..8 set the division value. A list of your audio devices available in your system. You will see your recording devices first. Below that, your output devices are shown with postfix [loopback]. When enabled S2L will stay on top of everything else. When enabled S2L will start processing upon starting the application. Shows a list of 20 sequences. Check the sequences that you want to restart with every beat. Shows a list of 32 buttons. Check the buttons you want to flash on every beat. The length of the button flash in milliseconds. Connect a proper line-signal from your mixer to your computer running S2L, or, if the same computer is playing out the audio, use the loopback as audio source. It doesn't really need to be a stereo line signal. It may perfectly be just 1 channel. As long as its quality is good, it will work just as good as stereo. Do not connect S2L behind a active crossover. You might break internal S2L logic's by doing so, which may result in bad beat triggering. But hey, if it works for you, use it as you please. Tip: If you're in a band with musicians and have a drummer among them, you might want to consider getting a clean feed from the mixer containing only the bass drum, and connect that audio signal to S2L's audio input. This feeds only the bass drum audio to S2L, which in turn will work very accurate with it, generating a trigger on each bass drum usage. Depending on your mixer you can create such a clean feed with an aux bus, with only the aux parameter set to on/open for the channel where the bass drum is at. All other aux parameters for the same bus should be closed or off. Consider using pre fader aux. But post fader will probably work just as good. Tip: If you're working with a laptop, chances are that you don't have a line level input, but only a mic level input. In some cases the input is software selectable to line-in. But in the most cases, its just a mic input containing a 5v phantom power. Keep that in mind. You cannot connect a line level source to that. It will get distorted sound, rendering S2L not working properly. You will need a real line level input. There are cheap USB audio devices out there. For just about €40,- you can get a USB audio device containing a line level input. S2L's audio source should now be configured properly. Time for a quick test. Just press 'Start' and make or play some music. Metering should respond. For best performance you should try and use any recording application of your choice, record a piece of audio and check the sound quality of the recording. If it sounds bad: fix it. Start the processing in S2L again. A good start is to enable all automatic functions (AGC, ATC, ABC) and set the beat frequency to 85 Hz. From here on you can try and tweak your settings in S2L to optimize your beat triggering. If you are looking for FreeStyler support (forum), go to www.freestylersupport.com. Having problems? See our FAQ for solutions, or use the FreeStyler forum for solutions. Every once in a while we receive e-mails from various people asking us if they can use this Sound 2 Light app for their own home-brew products, other than FreeStyler. We even received questions from a few (some big) software and hardware fixture brands to get involved with them. While we are really happy with people and companies wanting to do that, we initially let them know we are willing to work with them, but unlike our work for FreeStyler we won't do that for free and will be asking a market-based fee depending on the situation. Just use it with FreeStyler. Then its free. S2L is developed in C++ using Embarcadero C++ Builder CX 10.2 and with its built in skin support. A bug report can be done at FreeStyler Mantis bugtracker. The version number of the S2L application itself remained unchanged. Added some extra read/write configuration file error handling and information. This is now the stable release. 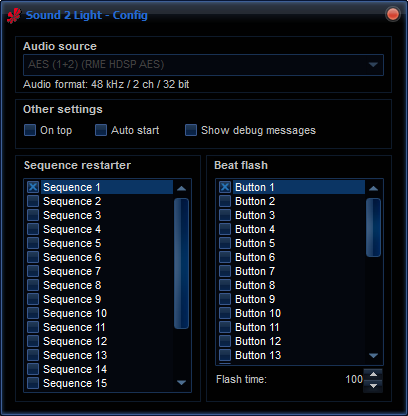 Sound 2 Light V1.0.1.11 is no longer supported. Added some extra information in the error dialog when a microphone device is reporting "Access Denied". This is due to a Windows 10 update problem (version 1803 and 1809), where some users report the microphone is disabled for apps in Windows 10 privacy settings. The extra information in the error dialog informs users to check their microphone privacy settings. You can download the old version 1 stable release here.